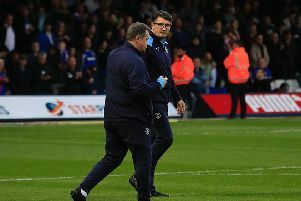 Luton Town missed out on a bumper FA Cup payday at Premier League giants Chelsea after a narrow third round defeat against Sheffield Wednesday this evening. Defeat was bitterly harsh on the hosts, as they had by far the better chances, with visiting stopper Cameron Dawson easily the busier of the two keepers. However, try as they might, Town just couldn't score, shut out for the second successive home game, with promotion to the Championship the only thing on their minds now. Interim boss Mick Harford made two changes, Kazenga LuaLua making his first FA Cup start for the club, while Luke Berry also came in, Danny Hylton beginning his four game ban and Alan McCormack dropping to the bench. The visitors' Adam Reach escaped Town's defence early on, but couldn't find the target, while Wednesday created another decent opening on 13 minutes, George Boyd over the top. Wednesday began to enjoy a good spell of possession, forcing Town back, but the Hatters stood firm, restricting their opponents to a long range attempt from Jordan Thorniley, easy for James Shea. Hatters had their first shot on target after half an hour, Jack Stacey overlapping well to fizz an effort straight at Dawson, and they finally opened up their opponents' defence moments later, Elliot Lee finding James Collins who dragged wide on his left foot. Luton then had a real let-off on 36 minutes, as Barry Bannan's speculative volley from distance was flicked on by Steven Fletcher, only to crash against the frame of the goal. The Owls just about avoided a calamitous own goal when a red-faced Tom Lees' backpass was out of keeper Dawson's reach, sliding narrowly wide. A buoyant Town really should have grabbed the lead on 42 minutes, when LuaLua's wonderful flick saw Lee take a touch only to blaze over from 10 yards. With their tails up, shots started raining in on the visitors' goal, James Justin's 25 yarder requiring a fingertip behind by Dawson as Luton ramped up the pressure in the closing stages of the first half. However, they switched off right at the start of the second period, and paid the price, as unable to clear their lines, Atdhe Nuhiu's close range effort beating Shea via a hefty deflection. Although the Owls began to boss possession once more, Luton weren't without their opportunities, Justin finding an unmarked Berry who was denied by Dawson's legs. Shea then made a crucial save as Wednesday overloaded the box, getting down smartly to gather Reach's low effort. Town brought on Dan Potts for Berry, and the sub almost had an immediate impact, racing away to beat a challenge, his rasping drive drawing a fine save from Dawson. It was all Luton from then and somehow the hosts weren't level on 77 minutes, as Sonny Bradley's downward header at the far post bounced up off Collins and on to the woodwork, leaving the striker mystified as to just how it stayed out. Andrew Shinnie's drive was parried by Dawson, Justin had shouts for a penalty turned down and then Pelly-Ruddock Mpanzu sliced wide as Luton searched for that leveller. Late on Bradley again met Justin corner, his header nodded off the line by Nuhiu as it just wasn't to be Luton's night. Hatters: James Shea, Jack Stacey, James Justin, Matty Pearson, Sonny Bradley, Pelly-Ruddock Mpanzu, Luke Berry (Dan Potts 69), Andrew Shinnie, Elliot Lee (Aaron Jarvis 88), James Collins, Kazenga LuaLua. Subs not used: Harry Isted, Alan McCormack, Lloyd Jones, Alan Sheehan, Josh Neufville. Owls: Cameron Dawson, Liam Palmer, Morgan Fox, Steven Fletcher (Marco Matias 90), Barry Bannan, Jordan Thorniley, Tom Lees, Atdhe Nuhiu, Adam Reach, George Boyd, Michael Hector. Subs not used: Joe Wildsmith, Joost Van Aken, Ashley Baker, Daniel Pudil, David Jones, Sam Winnall. Booked: Nuhiu 10, Collins 37, Palmer 61, Boyd 80.